The full moon rises over Earth in this view from space taken Nov. 17, 2013 by Japanese astronaut Koichi Wakata on the International Space Station. A full moon is rising for lovers on Valentine's Day, and it will be a Snow Moon. If weather permits, look up on Friday (Feb. 14) to see the full moon shining brightly in the winter sky. The moon turns full phase at 6:53 p.m. EST (2353 GMT) when it is exactly opposite to the sun in the sky. To most casual observers, however, the moon will appear full a day or two before and a day or two after Valentine's Day. This February full moon is known as the "Snow Moon" because the heaviest North American snows fall during this time of year. By coincidence, a major snowstorm is currently battering the U.S. East Coast today, just one day ahead of the lunar event. Friday's full moon is also known as the "Full Hunger Moon" because food was scarce and hunting was difficult for ancient tribes during this month. 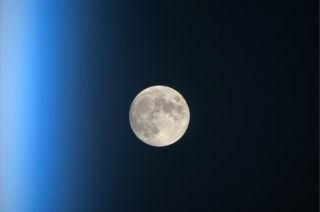 "A full moon shows up to Earthly viewers when the moon's orbit takes it around to the point where sun, Earth and moon line up," Space.com's Dave Brody said in a video about the moon and its effect on Earth. "The onrushing sunlight fully splashes the Earth-facing face of the moon." February holds other skywatching treats for avid stargazers who will brave the cold. Venus shines brilliantly in the morning sky this week, and on March 9, Jupiter and the moon will appear in the same part of the night sky, as they did earlier in February. A host of spacecraft will spend their Valentine's Day with the full moon. Among them, NASA's Lunar Atmosphere and Dust Environment Explorer probe (LADEE for short) will orbiting the moon on its mission to collect data about the natural satellite's thin atmosphere. NASA's Lunar Reconnaissance Orbiter has been making new discoveries about the moon's nature from lunar orbit since its launch in 2009. China's first moon lander and rover, Chang'e 3 and Yutu, will spend the holiday on the lunar surface. Editor's note: If you snap an amazing photo of February's full moon, or have any other night sky view you'd like to share with Space.com for a possible story or image gallery, please contact managing editor Tariq Malik at spacephotos@space.com.